Sometimes we all need a day off. 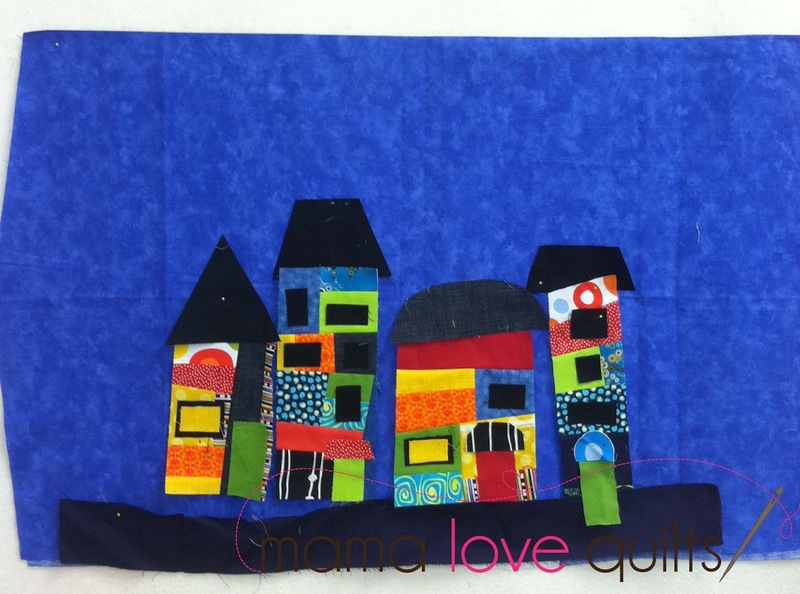 I left the kiddos with my mother-in-law and headed to my LQS for a class taught by Susan Powell, a quilter who makes these amazing improv quilts of city scenes. And not only is she a talented artist, she is also incredibly nice. If you ever get a chance to take a class with her, I highly encourage you to do so. Here is the city scene I started working on. Susan’s technique uses a very freeing approach to piecing. One of the first things she said is, “There are no mistakes.” That’s just the type of sewing I like! I still have a lot to do. I’ve got the windows to finish. I may add some stars and a moon. And what’s a city without people?!? I had a lot of fun getting this little piece started. I’m hoping for a good chunk of sewing time this weekend to work on building my city. Are You Sewing Along with Crazy Mom Quilts? I love improv sewing and love your buildings. I just took a week long class from Mary Lou Weidman who teaches you to be free in your sewing. I love being free! Her quilts look so cool! Wow! That's really cool! I've never done improv sewing! I'm glad you had the opportunity to attend the class!! I'm working on a denim quilt using my 2 son's jeans that I've been saving for a while. I'm glad you had a day off, its good for the soul. Love your little city, it looks like a fun place to live. That sounds so fun. I guess I will looking into where I can do that here in Atlanta. Enjoy your day off. I'm sitting in Barnes&Nobles now for my day off. Hooray for days off! Love the colors. Can't wait to see the finished quilt! Oh Wow!! That is awesome. I have never taken a sewing/quilting class. But sure would love to find a class like that in my area.